I recently returned from a trip in Botswana and Namibia with Wilderness Safaris. Resources First Foundation has served as the liaison for American supporters of Wilderness' non-profit organizations - Wilderness Wildlife Trust and Children in the Wilderness - for over a decade, because I believe they represent the best in business for conservation in Africa. (Click here to Donate.) As our pilot said to me on our last day in Namibia: "If you want to do conservation in Africa, the only successful portal is through the private sector." My two week sojourn with Wilderness brought back a flood of memories from my four decades of experiences in Africa, experiences which fundamentally shaped my focus and engagement in conservation programs throughout the United States. My first trip to Africa occurred in 1973 through the good offices of Robinson McIllvaine, then ambassador to Kenya who later oversaw the African Wildlife Leadership Foundation. McIllvaine introduced me to David Western, who opened my eyes to the need to involve local people as integral participants in the conservation of wildlife protection areas. He pioneered what is now called "community-based conservation" with the Maasai Amboseli Game Reserve (now Amboseli National Park) and Maasai Mara National Reserve in Kenya. His book, In the Dust of Kilimanjaro is one of my favorite books and is as relevant today as 20 years ago when it was first published. Western writes: "Conceding that local people can become the chief beneficiaries and custodians of natural resources and biodiversity is a truly momentous stride; this one leaps opens the door to a rural conservation long thwarted by misguided policies." Western's influence was seminal to my evolving perspective away from the traditional U.S. orientation towards acquiring more public conservation lands, and towards a new focus on the importance of private land stewardship across the country. I n 1977 I traveled overland from Nairobi, Kenya to Cape Town, South Africa and met Russel Friedman for the first time. 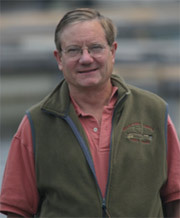 Russel later founded Wilderness Safaris with Colin Bell, and now chairs the Wilderness Wildlife Trust. Wilderness' conservation concessions protect over 7.8 million acres of prime wildlife habitat in Africa - that is equivalent of more than three Yellowstone National Parks. These concessions provide a rich and reliable source of revenue to local tribes in the most remote rural parts of Africa; their camps provide long term education and employment in rural areas with few other sources of emloyment except herding cattle. The model works: for Wilderness as a profit making company in a very competitive industry, and for local people who derive multiple sources of revenue as well as health and educational benefits. Over the years of my African travels, I witnessed multiple conservation success stories pioneered on private lands from the breeding of endangered wildlife at scale (think black and white rhinos) to Zimbabwe's original success with Campfire programs to involve local communities in wildlife management. In terms of longevity and scalability, Wilderness stands out ahead of all peers, which is why RFF is proud to serve as the U.S. foundation for Wilderness Wildlife Trust and Children in the Wilderness. As I write this, I am watching two dozen guinea fowl peck at the rock strewn desert and run helter-skelter while a couple of oryx graze warily on desiccated grass in a landscape more vacant and surreal than our own desert southwest. My African experiences were a major influence in my determination to set up Resources First Foundation to serve private landowners across rural America to facilitate conservation on a scalable basis. 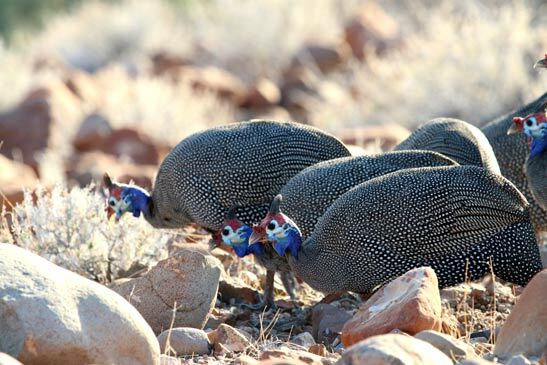 Photo: Guinea fowl at Desert Rhino Camp in Namibia.